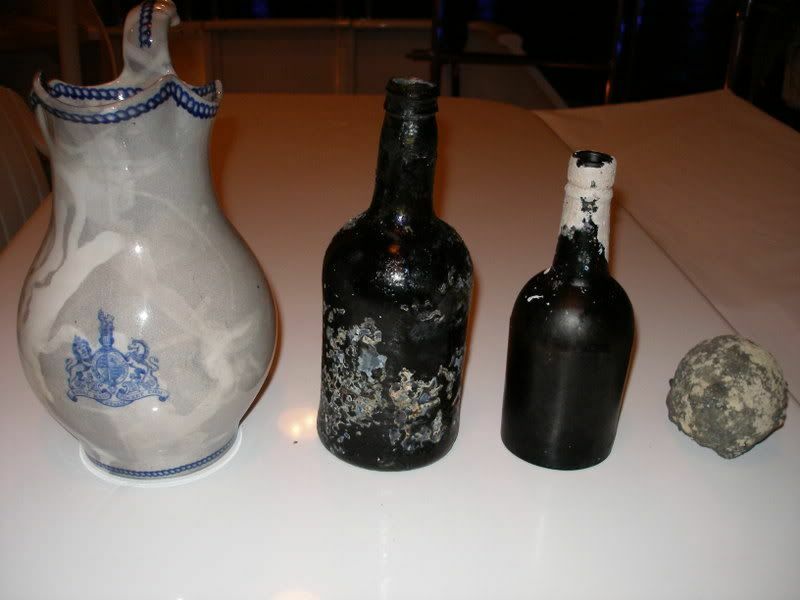 One pitcher from the old Royal Steamship Company, two 100 + year old rum bottles and a cannon ball. Plus a lot of broken very old bottles as well. Keep hoping for a coin before we leave. Very nice finds indeed Capt Bill. "Why tip-toe through life just to arrive alive at death?" Those are some awesome finds. Have fun! 1989 23' Arrowglass Merc 350/260 Alpha 1 I/O "Valkyrie"
"Don't try to outweird me, three eyes. I get stranger things than you in my breakfast cereal." Two torpedo bottles, a 200 year old rum bottle, a 300 year old "onion" bottle, 100+ year old bottle neck with cork still in it, 16lb, 8lb and 4lb cannon balls, swivel gun balls, musket balls, Civil War era bullet and two coins, one English and one Spanish. Plus other misc. stuff. Your collection is really cool! And to think I get excited when I find another 5lb soft weight! I would love to find something old and unique on a dive. Thanks for sharing. "But my chart plotter says the rock is over there..."
As far as the location goes, "I understand that the harbor area in St Thomas is still a gold mine for this stuff," sounds like you have a pretty good idea where it is already. Bazza, where's your charter pricing? By the way, great blog. Very nice finds. Nice to see another artifact diver saving our lost maritime past. Heading down to St. Thomas in about two weeks. Would like compare notes. Nice stuff. How deep are you finding these things, Bill? Capt Bill, this may be of interest to you. 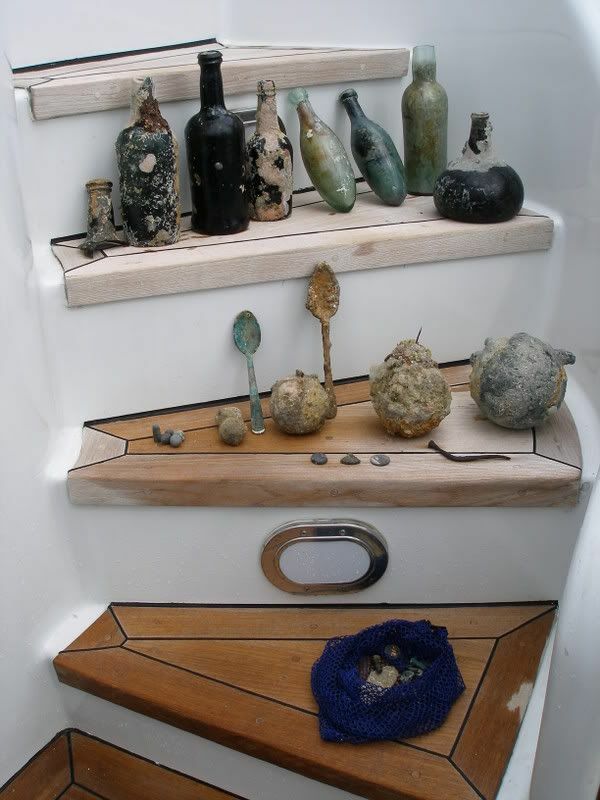 http://www.bertkilbride.com/giftshop/ I dive mainly the BVI and have found many bottles etc. If your interested I can give you the local of an old fort from the mid 1600 to early 1800 thats on land. I have visited it many times with my metal detector and have only found a couple of bits of modern junk. So I believe that its been left untouched. we have found many intact bottles and items like buckles,oil lamp wick adjusters,a fork, lots of musket balls and a ring. There are a few graves there as well. Its located on great thatch island in the BVI. If your going back to the VI its definitely worth a visit.